Two teams playing extremely well of late will meet up to decide a trip to the 3A state semifinals. The Sabetha Bluejays, winners of five straight games, will travel to Wellsville to take on the Eagles in a quarterfinal matchup on the east side of the bracket. Sabetha reached the quarterfinals by upsetting traditional power Silver Lake 34-28 last week. The Bluejays took advantage of six Silver Lake turnovers including an interception in the end zone on the game’s final play. Sabetha’s Brock Frey scored on a 28-yard touchdown run with just over a minute to play to break a 28-28 tie and give the Bluejays the victory. This marks the first time since 2000 that Silver Lake hasn’t reached the state quarterfinal round. Sabetha was once just 2-4 on the season with losses to quality teams in Nemaha Central (31-8), Holton (14-13), Perry-Lecompton (28-14), and Royal Valley (20-12). During the Bluejays’ five game winning streak, Sabetha has allowed only 10.6 points per game while scoring more than 48 per contest. The win over Silver Lake is by far the best on Sabetha’s resume. The aforementioned Frey rushed for 142 yards and two touchdowns in game and returned a fumble for another score. For the season, Frey has rushed for 1,334 yards and ten touchdowns. Fellow senior Trae Snyder has added 757 rushing yards and three scores, while junior Zach Edelman has 484 rushing yards and ten touchdowns. Quarterback Brandon Poe has compelted 64 percent of his passes for 677 yards and seven touchdowns. Wellsville has reached the elite eight in 3A for the second consecutive season. The Eagles fell to Silver Lake 20-14 in overtime in this round last season. Since 2010, Wellsville has been one of the classifications’ most consistent programs. The Eagles have posted a 52-16 record over that span, reaching the playoffs all six seasons and the quarterfinal round three times. The 2015 Eagles have won seven straight games since a 20-6 loss to 4A-I quarterfinalist Eudora back in Week 4. Wellsville’s other loss came 7-6 to Prairie View in Week 1. Speedy senior running back Zach Strawn leads Wellsville with 1,037 yards and 16 touchdowns. Strawn (6-0, 165) carried 12 times for 257 yards and four touchdowns in the Eagles’ 56-7 blowout of Neodesha last Saturday. He’s helped in the backfield by senior quarterback Tony Dougan who is second on the team in rushing with 465 yards and nine scores. Junior Daryon Winton is close behind with 459 yards and seven scores. Dougan has passed for 900 yards and 12 touchdowns with Strawn and Seth Breithaupt accounting for 632 of those yards and ten scores. The Norton Bluejays have two different versions of their 2015 season: one with senior all-purpose threat Gavin Lively and one without. Without Lively, who was injured late in the second quarter against Phillipsburg in Week 2, the Bluejays lost twice and had significantly lower offensive production. However, since Lively returned in Week 7, Norton hasn’t lost yet and delivered a road victory against Scott City, 28-24, last Saturday. Norton had fallen to the Beavers in the second round last season. Norton led 21-7 before Scott City tallied 17 straight points. Scott City took the lead on a fouth-down, Hail Mary with 2:37 left in the contest. However, the Bluejays regained the lead when sophomore quarterback Jace Ruder found Lively with 16 seconds remaining. Lively also scored early on a 64-yard flea flicker and a 10-yard run. He also tallied a five yard touchdown run. In just six and a half games, Lively has 81 rushes for 850 yards and 17 scores, 11 catches for 329 yards and five scores. Everything except the reception total paces Norton. He also has 126 return yards. In games Lively plays, Norton has averaged 382 yards of offense and 7.1 yards per play. The Norton defense is let by junior Jacob Green’s 129 tackles, including 29 tackles for loss. Collegiate has played the No. 48 strength of schedule (SOS), while Norton has faced the No. 14 SOS. 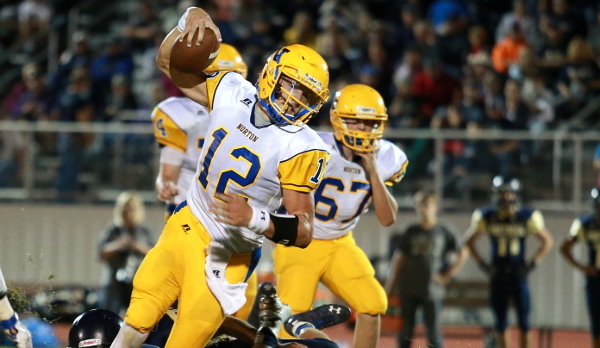 The Spartans have dominated everyone on their schedule, except for a 46-45 overtime victory over Andale in Week 3. Collegiate has a collective margin of 624-97 and ranks No. 2 in offense. In the first two rounds of the playoffs, the Spartans have beaten Conway Springs, 63-6, and Garden Plain, 41-6. The Spartans average 376 yards and 8.6 yards per game behind senior quarterback Austin Waddell and senior Nathan Burgoyne. Like Lively, Burgoyne is the team’s leader in rushing and is also a standout receiver. Burgoyne has accounted for 1,316 rushing yards and 28 rushing touchdowns. He also has a team-high seven receiving scores. Junior Cooper Root leads the team with 66 tackles, four for loss, and senior Will Locke has 11 TFLs. Collegiate’s defense played well versus Conway Springs and Garden Plain and even limited Andale to just 5.1 yards per play on 364 total yards in the victory. This is the first matchup since 2009 when Collegiate traveled to Norton and won 56-21 in sub-state en route to capturing the state title a week later. Senior Blake Jablonski, on his way to several single-season passing records, threw for 233 yards and three scores in that game. Norton has the talent to pull the upset, and the Bluejays very well could win this game. However, Collegiate’s defense – a bit unheralded this season compared to its high-powered offense – will be key.